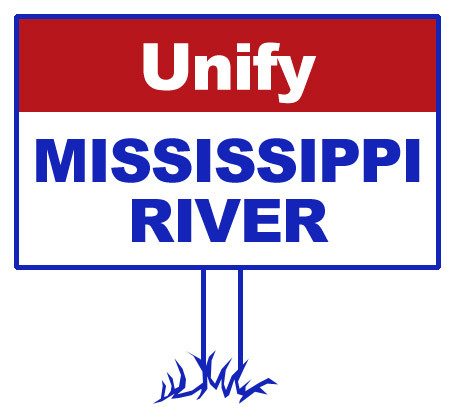 What if it was possible to agree on a unified approach to the Mississippi River? I know, it’s a BIG river and a complicated one. It’s different on the upper end and the lower end. There are so many stakeholders with their own interests that it makes your headache just to consider it. But there are lots of complex and large entities addressed and coordinated in many fields these days and that doesn’t stop them from creating a common vision and goals to go with it. In fact, if we look at most rivers, lakes and forests, we’ll see that there are multiple issues, stakeholders and options for the futures of those resources, too. We’re able to come up with overall goals and approaches to their sustainability. Why not the Mississippi River? Of course, the answer is “we can”. Last week I was reminded of this possibility listening to planning officials from St. Cloud, Minnesota where the Mississippi River is the focal point of the city’s economic development planning. They recounted not only their accomplishments in increasing access to the river, drawing business to their towns along the river, and cleaning up the river, but also their struggles along the way. In the beginning, they started with conversations. In the middle, they continued the conversations in larger groups. They mobilized around specific proposals. And, they persisted in the face of discouraging losses. But the conversations were key. Face-to-face conversations – and food – were pivotal to building a constituency for their 27-mile section of the river that is shared by two counties, nine townships and multiple single interests. As conversations continued, common ground was established. Energy and commitment to shared goals was built. Also key: public and private partnerships grew out of the conversations adding to the capacity to accomplish those common goals. Why is this important now and for the whole river, not just section by section? Because opportunities and threats increasingly come in whole river dimensions. Infrastructure improvements have whole river implications. Increased barge traffic affects the whole river as do agricultural practices. Tourism on the River is taking on whole-river proportions, too, with the announcement of increasing river boat tourism. The list is growing rapidly. So what keeps us from unifying our approaches for the whole Mississippi River? In an era of Internet communication, geographic impediments have fallen away. With all the known potential of collabora tion, organizational self-interest should be set aside. And, with the plethora of social media tools, we should be able to engage and activate regardless of location. The excuses of size and complexity don’t cut it anymore. Somewhere, somehow we have to hold the initial conversation. We have to build the launchpad for a unified Mississippi River. Regardless of whether we focus on infrastructure or habitat; tourism or transportation, a National Dialogue for the Future of America’s Waterway was designed to be that launchpad. Based on proven decision-making processes, existing and developing software and nationally recognized principles for engagement, a National Dialogue for the whole Mississippi River is not only possible, it’s practical. If you, too, want to see the conversation started, weigh in. We need to start the discussion. This entry was posted in Future of the Mississippi River and tagged A National Dialogue for the Future of America's Waterway, Minnesota, National Dialogue for America's Waterway, Principles of Public Engagement, St. Cloud. Bookmark the permalink.